Living the dream is a phrase overused to a point of meaninglessness. But make no mistake about it, Chris Hemsworth is living the dream. 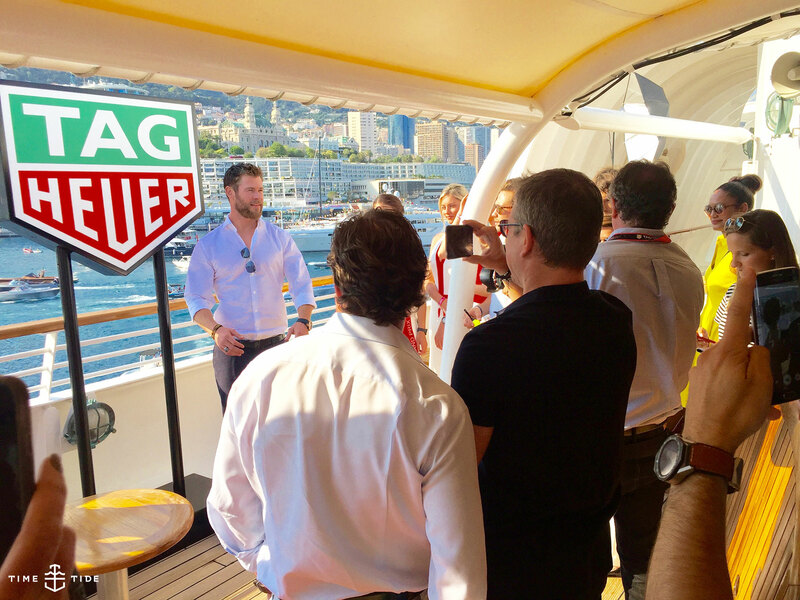 We meet on a yacht in Port Hercules, Monaco, hosted by TAG Heuer. It is to be our home for the next few nights as the Monaco Formula 1 takes place on the streets of Monaco which pass right by the boat. 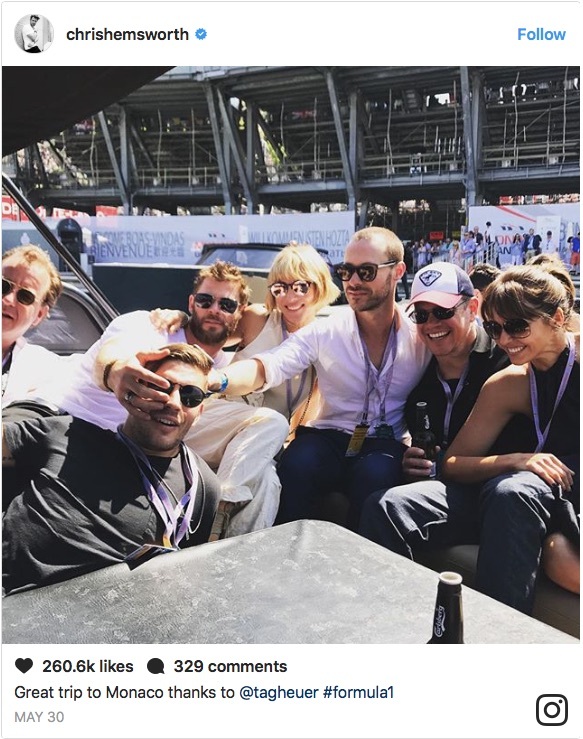 When qualifying begins, the scene on deck is an odd mix of Dunkirk – with high-octane engines whining around the boat like a swarm of Spitfires – and Ocean’s 11, taking into account the intimidating savoir faire of other guests on the boat, a mix of global influencers and luxury lifestyle media. The Ocean’s 11 atmosphere is heightened by the presence of Matt Damon. Matt and his wife Luciana are guests of Chris, whose wife Elsa is joining him for this little sojourn. The entourage also includes Chris’ personal trainer, a buff rooster of a young lad with sleeve tatts and a taste for spirits. 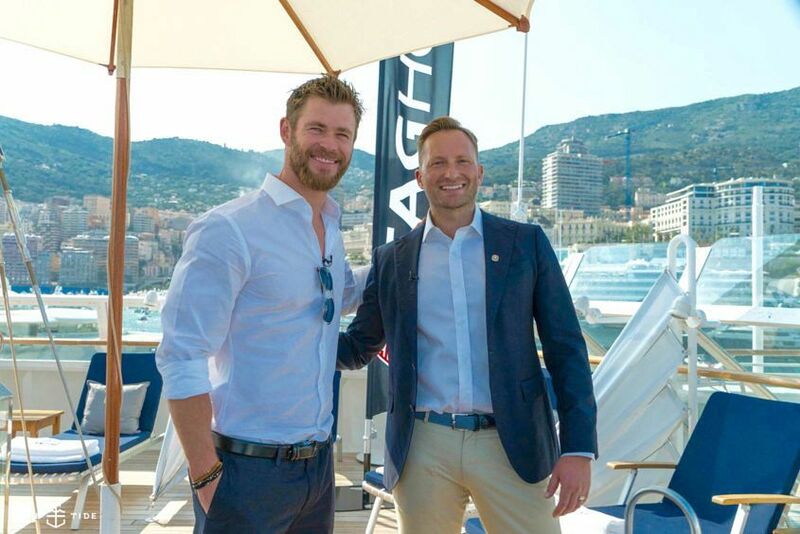 On the shuttle boat between the TAG Heuer yacht and the lodge, after patting himself down for several minutes, he announces that he has lost his phone from the night before. 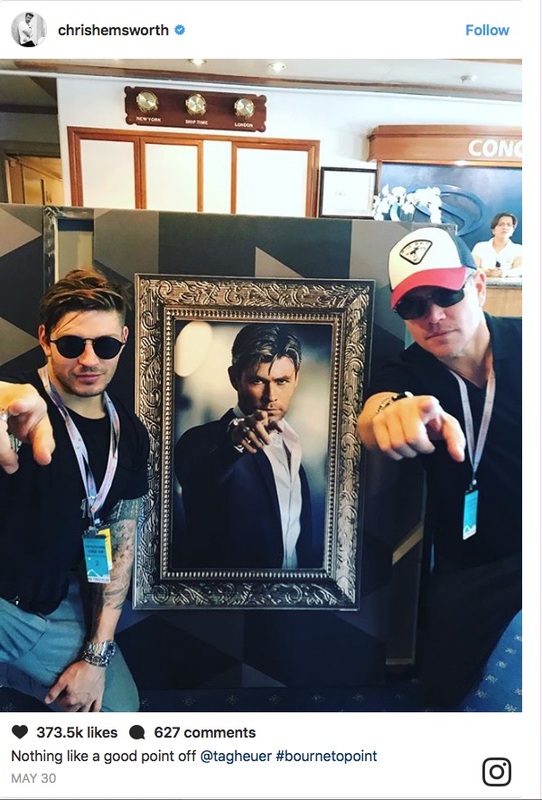 Damon and Hemsworth help him retrace his steps. It really is all happening. But with great roles comes great responsibility and you get the sense, from the outside, that ‘being a superhero’ over an extended period pervades every minute of every day; the only time over the jaunt that he is spotted eating, it’s a plate piled high with beef carpaccio on race day. Very Thor, actually. The regularity of the Thor-related Marvel movies has delivered some serious upside in terms of lifestyle. It has meant that Hemsworth can move his family home to Australia, where they have settled on a 4.2ha property just outside of Byron Bay, on the north coast of New South Wales. The eight-bedroom, 11-bathroom property, purchased for $7 million three years ago, is undergoing a renovation costing more than the original purchase price – which means Hemsworth is in Australia to stay for the foreseeable future. Hemsworth the dad is ever-present in conversation; you establish quickly that it is a core part of his identity. He has three children with Pataky, who he married after a whirlwind courtship in 2010; one daughter, India Rose, and twin sons Tristan and Sash. Despite his, and Damon’s current freedom – which the whole entourage are taking advantage of to the absolute fullest – many of his anecdotes include his children. They are clearly on his mind all the time. His journey as a dad is eminently relatable. 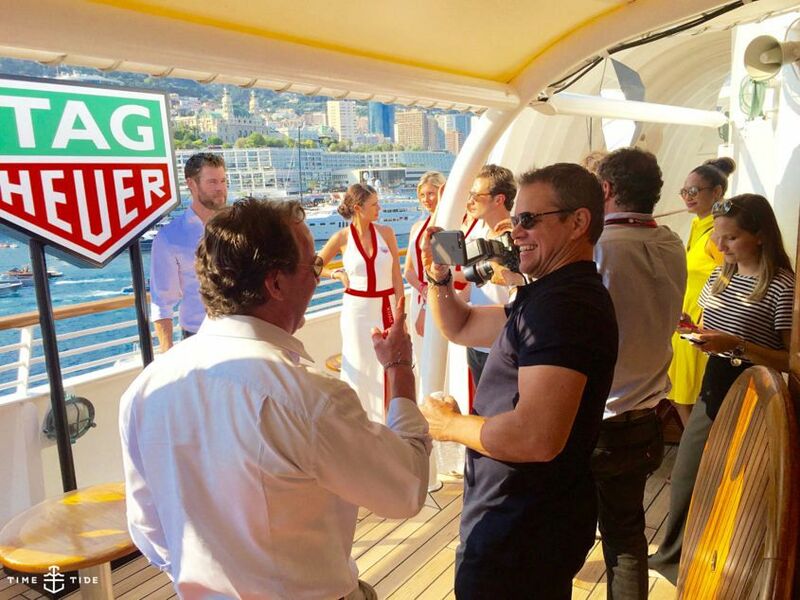 You have to applaud TAG Heuer for their choice of Hemsworth as an ambassador, and also their timing in choosing him, which was right before he crested the Hollywood wave as a bona fide A-List megastar. With all due respect, the better question is: why did he choose TAG Heuer? He’s not wrong. 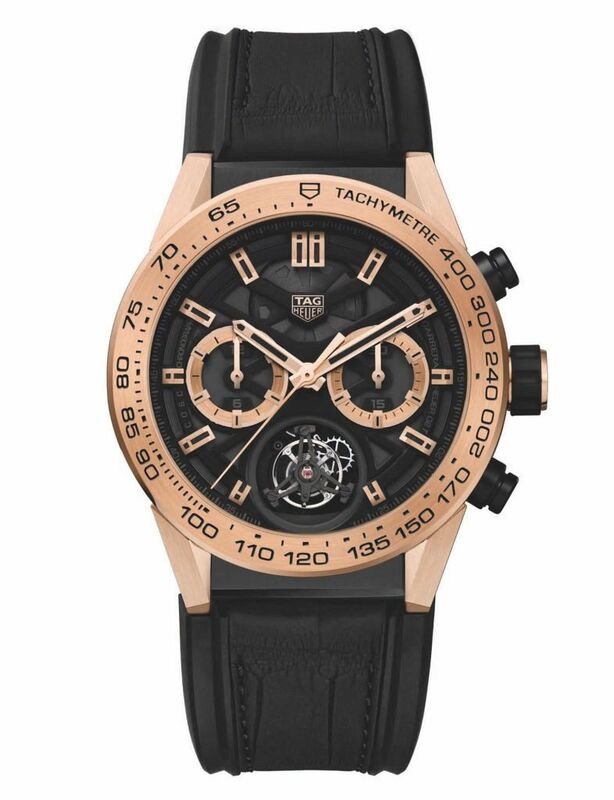 My first awareness of a ‘good watch’ was, to put a fine point on it, a TAG Heuer Formula 1 at secondary school. 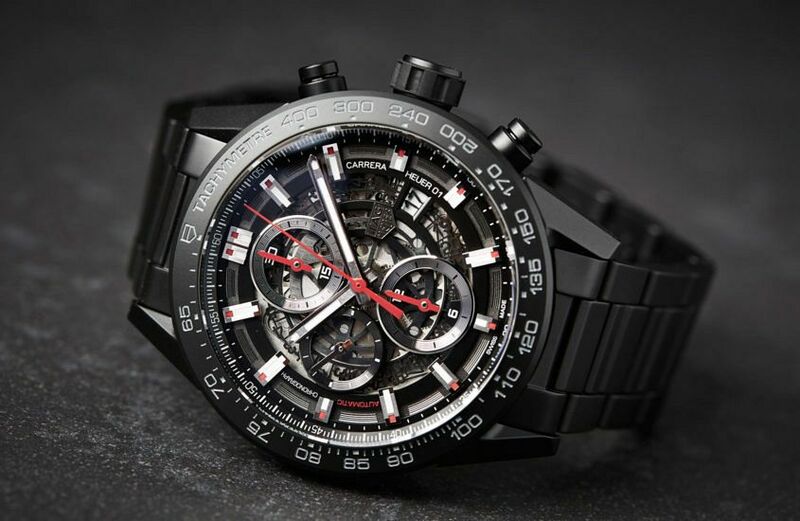 The connection between TAG Heuer and Australia is surprisingly deep. Sydney’s TAG Heuer boutique is, in fact, the highest-grossing in the world, per square metre. He proffers the Heuer-O2T in rose gold for inspection and claims it to be just such a watch. “I wear this one surfing, I wear it to the gym.” The horological geek inside me starts hyperventilating at the thought that a model with a tourbillon – the king of all watch complications, designed to counteract the effects of gravity by rotating the escapement and balance wheel in a cage – could ever be worn in the waves. But, it’s so delicate! But, it’s gold. For the love of Mary, it’s a tourbillon! 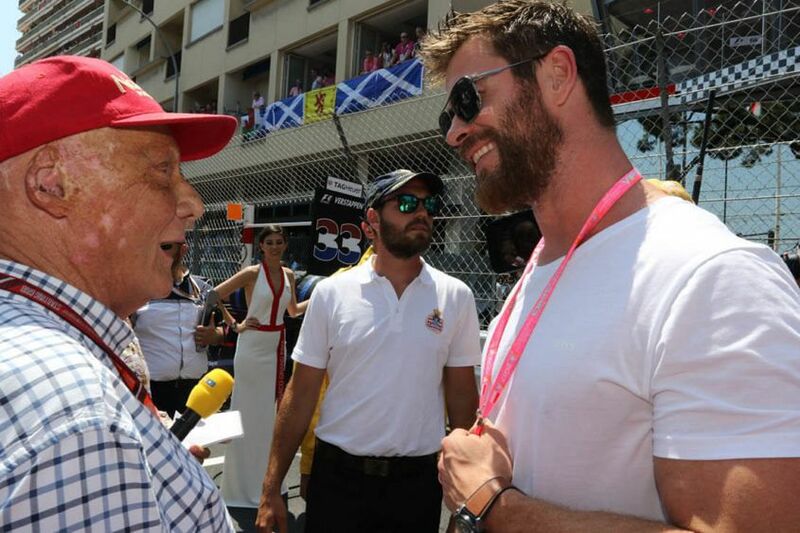 Hemsworth, listening, smiles warmly – he has this uncanny Father Christmas-like twinkle when he smiles, by the way – but it’s a moment of pause, not just mirth. With Port Hercules behind us forming a glittering backdrop, we are in reflective, deeper waters again. Asked what kind of a legacy he’d like to leave as a dad, we happen upon a sweet spot and he continues to elaborate as the topic unrolls. “It’s just to be present. It’s so easy to be distracted. “I feel like when you look around these days every second person’s got their head in their phone. Your own kids are saying ‘dad look at this’, and you’re like, ‘yeah, that’s cool’,” he says, pretending to wave his kid away with his head bent over an imaginary phone. “I’m guilty of it too at times, but lately I’m making a real effort to just put the thing away. We turn around and complain all the time that they don’t sit still, but what kind of example are we setting? We’re all guinea pigs in the generation of the iPhone and I think we’ve all got to start paying attention to what the ripple effect is. “Now, I choose an hour or two of the day where I need to look at it, but not be 24 hours a day on call, and just be with them [his kids]. Because you think they’re not paying attention, but they do. You have a close look – they look up and they say, ‘Oh, you’re busy again, it must be work.’ And that breaks my heart.